Jupiter’s icy moon Europa is a major target of astrobiology research in light of the possibility that it offers a habitable environment in the Solar System. Under its ice crust, estimated to be 10 km thick, is an ocean of liquid water of over 100 km deep. A huge source of energy deriving from gravitational interaction with Jupiter keeps this water warm. Theoretical research to evaluate the microbial habitability of Europa using data collected from analogous environments on Earth has been conducted by a group of Brazilian researchers linked to the University of São Paulo (USP) that jointly signed an article published in Scientific Reports. 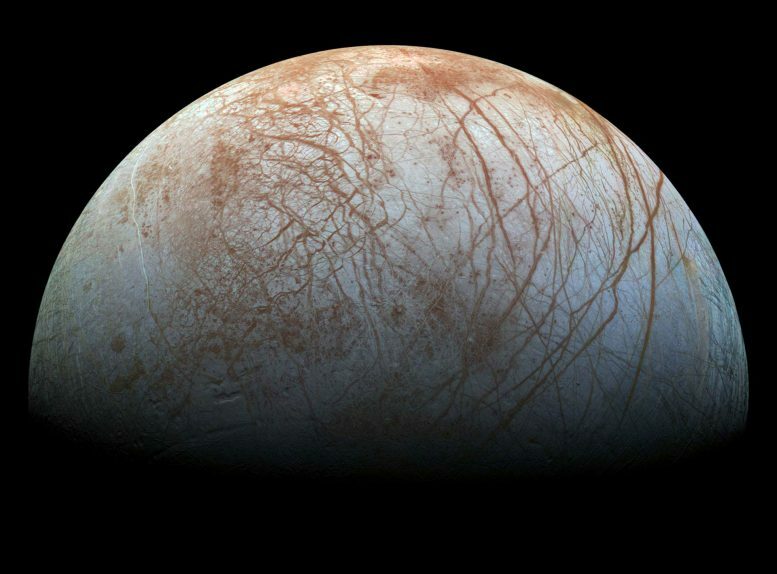 “We studied the possible effects of a biologically usable energy source on Europa based on information obtained from an analogous environment on Earth,” said Douglas Galante, a researcher at Brazil’s National Synchrotron Light Laboratory (LNLS) and the Astrobiology Research Center (NAP-Astrobio) of the University of São Paulo’s Institute of Astronomy, Geophysics & Atmospheric Sciences (IAG-USP). Galante coordinates the study, supported by the São Paulo Research Foundation – FAPESP through a Master’s fellowship from chemist Thiago Pereira, co-author of the article who has in Galante his supervisor, and through a Thematic Project which aims at investigating places in Brazil and Africa with possible vestiges of geochemical and isotopical transformations related to the emergence of multicelular life in Neoproterozoic Age. In the Mponeng gold mine near Johannesburg, South Africa, at a depth of 2.8 km, the research project not only found traces of major changes linked to history of life on Earth, but also a terrestrial contexto analogous to Europa. It was recently discovered that the bacterium Candidatus Desulforudis audaxviator survives inside the mine without sunlight by means of water radiolysis, the dissociation of water molecules by ionizing radiation. According to Galante and colleagues, the environment colonized by bacteria in the Mponeng mine is an excellent analogue of the environment assumed to exist at the bottom of Europa’s ocean. Although the temperature in Europa’s surface is next to absolute zero, there is an enormous amount of thermal energy in its core, as an effect of Europa’s interaction with Jupiter’s powerful gravitational attraction, which causes the satellite’s orbit to be extremely elliptical, meaning Europa finds itself either to close or too far from the Gas Giant. That makes the icy moon to suffer geometrical deformation as it moves at the mercy of Jupiter’s immense tidal force. The energy released by the alternating states of elongation and relaxation makes Europa’s subsurface capable of hosting an ocean of liquid water. “However, it’s not enough for there to be heated liquid water”, said Galante. According to the researcher, the basis for all biological activity known to Earth are the chemical gradients, i.e., differences in concentrations of molecules, ions or electrons in distinct regions which produce a flow in a certain direction, allowing the occurrence of cellular respiration, photosynthesis, ATP production and other processes common to living beings. The group evaluated how chemical imbalance in Europa could be initiated through the emanation of water leading to chain reactions between water and chemical elements found in Europa’s crust – however, a total lack of empirical data prevents scientists from unequivocally presuming any of these events (an “Europa Mission” may take place as late as 2030, stated Nasa, the US space agency). “That’s why we looked for a more universal physical effect that was highly likely to occur. That effect was precisely the action of radioactivity,” Galante said. Celestial bodies in the Solar System with rocky cores share the same radioactive materials, ejected in space by the Supernova explosion that originated the Sun and the planets. Uranium, thorium and potassium are the radioactive elements considered by the research, which estimated the concentrations for these materials in Europa, based on the quantities already observed and measured on Earth, in meteorites and in Mars. “From these amounts, we were able to estimate the energy released, how this energy interacts with the surrounding water, and the efficiency of the water radiolysis resulting from this interaction in generating free radicals,” Galante said. According to the study, along with radionuclides, pyrite is a crucial ingredient whose presence is indispensable for life in Europa. “One of the proposals deriving from our study is that traces of pyrite should be looked for as part of any assessment of the habitability of a celestial body,” stated Galante. Chances for finding pyrite in a hypothetical mission to Europa are good, since sulfur (S) and iron (Fe) are elements found in abundance across the Solar System. 1 Comment on "New Hydrothermal Model Evaluates the Possibility of Life on Jupiter’s Moon Europa"
There is some interesting science here but hydrothermal vent over-optimism is merely the latest naturalist hypothesis destined to fail. There is none of the critical controls of parameters required for OoL in the deep-sea. The supposed energetics are not sufficiently regulated to preclude that the same biochemical assemblies that they may promote would just as easily be destroyed. Excessive salinity, ph, temperature and ocean current control, but most importantly, the colocation, coincidence, concentration, contamination mitigation and construction and bio-synthesis of homochiral, homopolymers, ribisomal and nucleotide coded assemblies has no naturalistic viability.